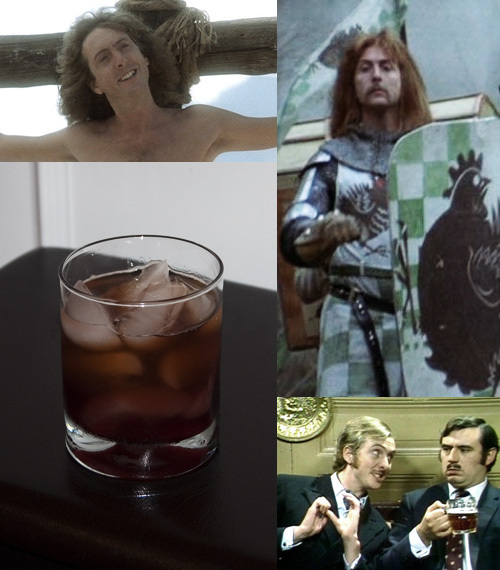 My production of Spamalot opens tonight, and so I present the last of the cocktail series with its creator, Mr. Eric Idle. Stir all but the ale with ice, then strain into old fashioned over ice. Top with the ale. 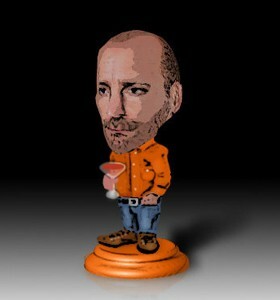 Of course I had to do something with Spam. I have infused whiskey with bacon, so doing the same with Spam didn’t seem like too much of a stretch. I sautéd some Spam and had it sit within a bottle of Jack Daniels overnight, then strained out the meat and fat. The Jack Daniels choice was merely because I had a bottle sitting around, I will admit, though it did pair nicely in the end. The result is just a faint flavoring that doesn’t overwhelm (I don’t think you would know if I put a shot in front of you). After that, for an additional nod to Holy Grail, I grabbed some Benedictine for Brother Maynard (after toying with the thought of some pine-infused eau-de-vie for Roger the Shrubber or an egg for Sir Robin), which added some herbal sweetness. I didn’t want too much, because I also had some rich sweetness from the Cockburn’s port. This ingredient was chosen primarily for its name, as it was the best I could find for acknowledgment of Mr. Idle’s classic “wink wink nudge nudge” character (“Cockburns? I bet it does, I bet it does!”) — perhaps hitting the nail a little too hard on the head, but a double entendre was harder to come by in the liquor store than I expected. At this point, I had a rather heavy drink, so the Cocchi Americano fortified wine helped to brighten it up a bit and add some bitterness. Yes, the ingredient is actually Italian, but the Americano tag was a tip of the hat to Mr. Idle’s American residency for the past 30 years. As I was putting this together, I came across the official Monty Python Holy Grail Ale (tempered over burning witches). I just had to. Topping this concoction with the ale was a welcome touch, actually, upping the bitter and muting the sweetness and creating a nice balance.